Although tall pitchers have the advantages of long arms and long strides, there is a larger player universe of shorter pitchers, so shorter pitchers compensate with other attributes. Therefore, one would expect there to be little correlation between height and fastball velocity for Major Leaguers. I took the top 10% fastest pitches for each pitcher 2008-2009, and found little relationship between velocity and height. Clearly, that's Wakefield who is the only pitcher unable to reach 80 MPH. Only pitchers between 6 feet and 6'6" have hit 100, which I suppose is interesting. The inherent advantages of being tall are masked by looking at things this way. Still, I thought that I would be able to find some sort of height benefit by looking beyond raw velocity. I was wrong. My idea was to look at the difference between the velocity normally estimated at the 50-foot mark by PITCHf/x cameras and the velocity estimated at home plate. Hypothetically, I thought, tall pitchers should release the ball closer to home plate than shorter pitchers, and therefore there should be a smaller difference between the starting and ending velocity of such a pitch. The data didn't back that up, and the more I think about it, the less the hypothesis makes sense. I tried to fit a model using height, velocity, release point, and spin to predict the drop in velocity from start to finish. Kei Igawa lost the least velocity, and Igawa's been known in his brief time for an extremely long stride, while Shaun Marcum lost the most velocity, and I was able to find some research showing he had a short stride. Yet I think the list is mostly random. If two objects, acted upon by different forces, are traveling at the same velocity at any given point with the same atmospherics, then the original point of impetus shouldn't really make a difference in their rate of deceleration. So unless a pitcher is releasing the ball within 50 feet, I think the initial velocity is the only PITCHf/x recording one needs, and height doesn't matter with this type of data. Be sure to check out Eric Seidman's work on perceived velocity. 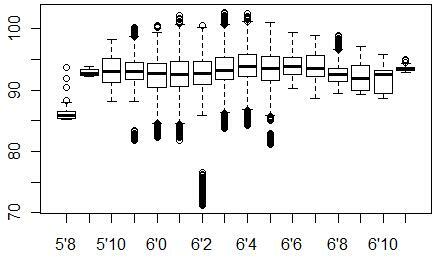 Interesting plots to look at, although it might be helpful to see the number of pitchers sampled for each box plot / height in order to get an idea how many pitchers outside of the 6'0" to 6'6" range almost hit 100 MPH. I do suppose that if you theoretically standardized every pitcher's motion and mechanics with one another, that you might see taller pitchers having longer strides, and therefore, lose less velocity between release point and home plate. Yet, the difference has to be so negligible compared to the effects that physique presumably has on pitching mechanics that I'm not sure if full-scale research on this is worth it. Still, very interesting question to think about. I have found that initial velocity and velocity at home plate varies a lot wi High School pitchers.One kid might go from 82 to 77 while another might go from 82 to 75. I saw one kid lose as much as 10 MPH, while most are in the 4-7 range. I have suspected that it is due to mechanical cause, but your point about initial velocity causes me to wonder. "I thought, tall pitchers should release the ball closer to home plate than shorter pitchers, and therefore there should be a smaller difference between the starting and ending velocity of such a pitch. The data didn't back that up." I am surprised at this. I'm afraid I wasn't clear. Height certainly matters, and how close you release the ball to the plate matters. I thought I would be able to infer such measurements from the PITCHf/x data, but I was wrong about that. So my point is that with PITCHf/x, we know the velocity estimates at 50 feet and 0 feet, and the difference apparently tells us nothing. If we knew the velocity estimates at the actual release point, and at 0 feet, that would be hugely important.